This is not an official website of the Dalai Lama, nor of any formal organization linked with him. This web campaign has been developed by a group of people moved by the Dalai Lama’s vision of a force for good. 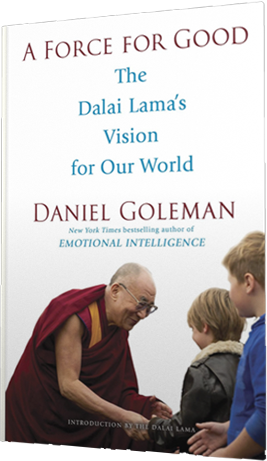 Our goal is to reach as many people as possible with the essential points from Daniel Goleman’s book, A Force for Good: The Dalai Lama’s Vision for Our World. Tara Bennett-Goleman saw that the message in A Force for Good would reach a wider audience if it were captured on the web. She is the founder of this web platform and helped guide its development. Jessica Brackman found the right partners to launch this web platform and helped in many other ways. Our funders made this possible: Tara Melwani, Connie and Barry Hershey, Pam and Pierre Omidyar, Don Morrison, and an anonymous donor. All royalties from the book will be donated to charities. Beyond expenses, virtually all time and labor in preparing this web platform have been offered pro bono. In A Force For Good: The Dalai Lama's Vision for Our World, Daniel Goleman outlines a singular vision for transforming the world in practical and positive ways. All royalties from the book will be donated to charities.